Andrew Hemingway taught Art History at University College London from 1987 to 2010. Since 1990 his research has focused primarily on U.S. art and culture, with particular reference to the period c. 1900-1955. 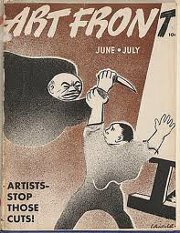 A concern with the history of the left and of workers’ movements in the twentieth century resulted in his 2002 book Artists on the Left: American Artists and the Communist Movement, 1926-1956 (Yale University Press, and in the edited volume Marxism and the History of Art: From William Morris to the New Left (Pluto Press 2006). In 2002, he initiated the seminar ‘Marxism and the Interpretation of Culture’ at the Institute of Historical Research (University of London, School of Advanced Study), and was active in the organizing group until 2010. He has also co-organized two major international conferences held at UCL: ‘Cold War Culture’ (with Adrian Forty, 1994) and ‘Marxism and the Visual Arts Now’ (with Matthew Beaumont, Esther Leslie and John Roberts, 2002). His latest book, The Mysticism of Money: Precisionist Painting and Machine Age America, will appear with Periscope Press later this year. 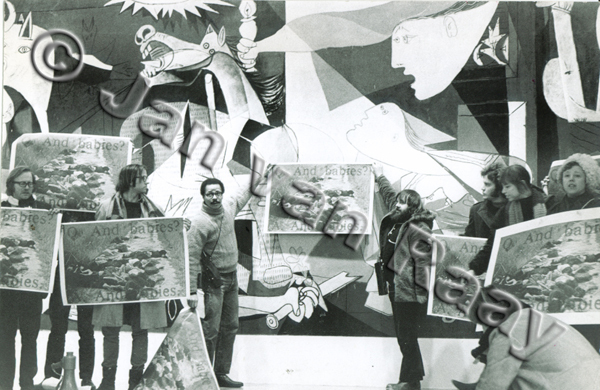 January 8, 1970, Art Workers’ Coalition and the Guerilla Art Action Group protest in front of Picasso’s “Guernica” at the Museum of Modern Art, New York City with the AWC’s “And babies?” poster. To all that may not have noticed, it is Ernest Hemingway. Just ONE m.